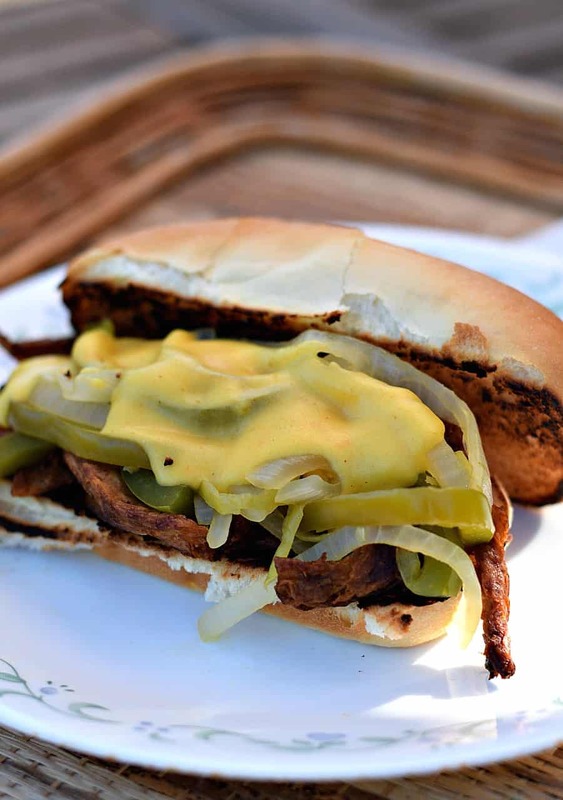 Soy Curls are amazing and make so many of our old favorites possible….. like these Philly Cheese Curl Sandwiches. Marinated strips of juicy ‘beef’, smothered in sautéed onions and bell peppers, topped with a melted cheese sauce. Excuse me while I …. nom nom nom…. 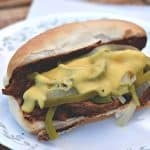 I remember it well……my very first Philly Cheesesteak that is…..
Years ago, I got a call from a hi-tech headhunter asking me if I’d like to come interview with the company he represented…..in Philadelphia. Now I had already visited much of the the Unites States by then, but there’s one area that I’m still not that familiar with today – and that’s the Northeast. So it was a no-brainer that I’d go – I mean free trip and all. And the only thing I remember about that interview (other than I obviously didn’t take the job) was this little sandwich shop they took me to for lunch. 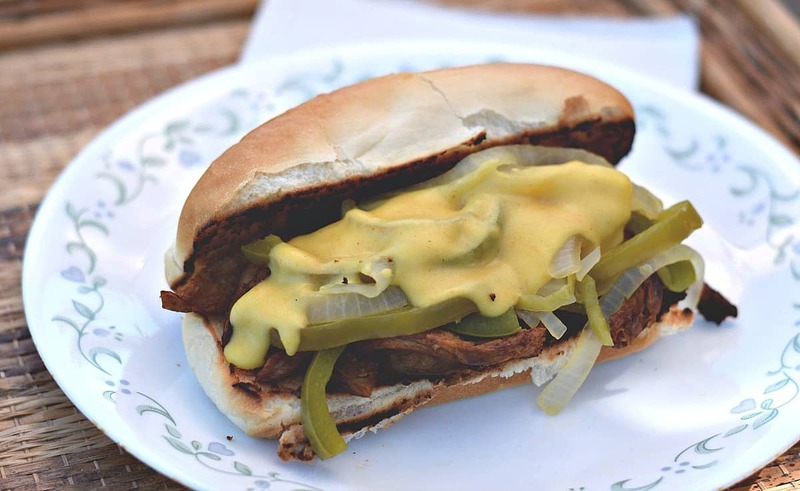 And it was there that I had my very first – as authentic as they come – right from the heart of Philly – Cheesesteak Sandwich. Oh – my – gosh it was good, I’ll never forget that experience. So as I was looking at a bag of Soy Curls on my counter yesterday, with leftover Cheese Sauce in my fridge……well it was obvious the 2 would have to come together. So please, allow me to introduce to you, my “soon to be famous” – Philly Cheese Curl Sandwich. Simpe recipe. Very simple. I promise. First we’re going to soak some Soy Curls to rehydrate them. Dump about ½ an 8oz bag of Butler Soy Curls into a bowl and add about 1 cup of Low Sodium Veg Broth, 1 cup of water, and about ¼ of Low Sodium Soy Sauce. I also added 1 tsp of Kitchen Bouquet Browning Sauce to give the curls a nice dark color. It’s usually located in your supermarket next to the A1 and Worcestershire. If you can’t find it – no worries – it’s mostly for color but it does add a hint of sweetness. Let that sit while we tend to the veggies, and don’t worry, I’ll include a link to the Soy Curls at the bottom of the recipe. Otherwise you can find them at your local Food Co-op or Whole Foods. 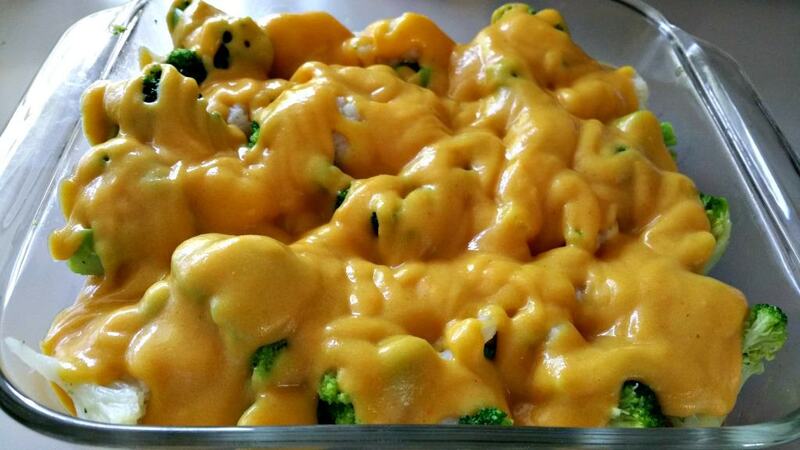 This cheese sauce keeps well in the fridge – great for leftovers. Wait – you DO have some leftovers in your fridge right? RIGHT?!? If not – go whip up a batch right now! I’ll wait…..
Ok – cheese sauce ready? Good. If you’re using leftover Cheese Sauce like I did, add a tiny but of Unsweetened Almond Milk and whisk over low heat. It will thin down nicely, perfect for pouring over a sandwich. Slice up 1 sweet onion and 1 green bell pepper into strips. In a non-stick skillet, we’re going to sauté these with a little water, just until they are nice and soft. When they’re ready – remove to a bowl and set aside. Drain the liquid from the Soy Curls – and dump these into that same pan. We’re going to sauté the Soy Curls over medium high heat just until they start to brown. Add a little Veg Broth as needed to keep things from sticking. Also make sure to leave enough ‘juice’ in the pan so they’re not too dry…. we want juicy curls, not shoe leather…. Traditionally, Philly Cheese Curl Sandwiches are served on a Hoagie Roll, but I say use whatever bread you like. 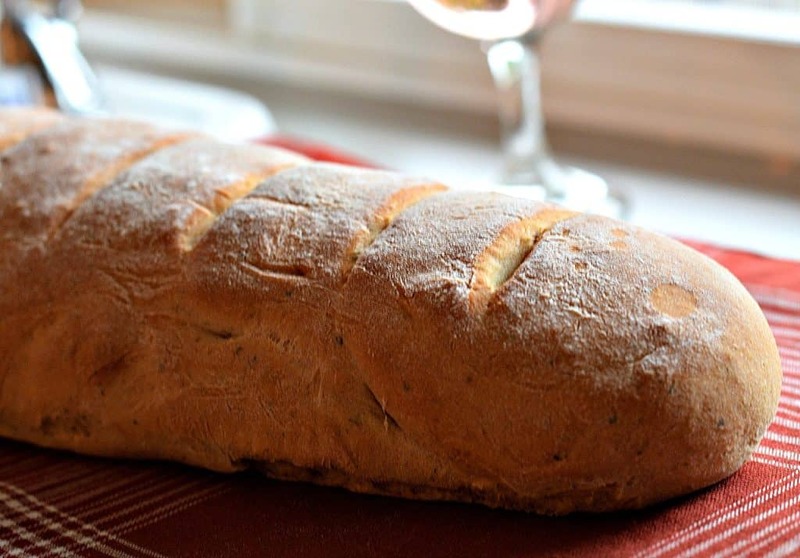 The Whole Wheat French Bread I made in my Fat Free Bruschetta Recipe would be awesome for sandwiches. I like to toast my bread a little to get a nice brown crunch to it, then pile on the Soy Curls. Add a little cheese sauce, just a bit, then stack on a good layer of Onions and Peppers. Add a bit more Cheese Sauce…. and I highly recommend a few pepperoncinis too…..
Hey – it’s potatoes and carrots already….. it’s a healthy cheese! Throw in some homemade potato chips, oven baked french fries (cheese fries?!) , whatever side dish you wish and…. Is there any substitute I could use for “Kitchen Bouquet Browning Sauce” ? Thanks! It’s mainly for coloring – so you can leave it out without affecting the taste.